Simple and honest, this is a subtle and enduring green apple flavor that will keep you coming back for more. Simple and honest, our Appleicious e-liquid is a subtle and enduring green apple flavor that will keep you coming back for more. Recalling a Granny Smith or Crispin straight from the tree, it has a well balanced combination of tang, sweetness, and sour blended with 70%VG and 30% PG that is great on its own or mixed with other fruits. Sure to create the clouds you want, try it with our gourmet caramel based flavour. 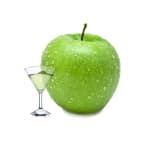 If its mint you crave, try our Minty Apple for a high VG juice that you’ll be sure to love. "Fresh green apple that delivers sweet and sour tones in the best way possible." "A well rounded green apple flavor that keeps me coming back"
I was expecting a good tasting apple flavour but when i hit my vape, it tasted like perfume. Very disappointed. I like the crispness I get from Applelicious better than any other apple flavour I’ve tried. Usually they taste like apple juice or jolly ranchers. This one tastes like actual apples. Yooooo get yurself some of this. Lit. Tastes exactly like double apple shisha to me, but without the tobacco. Great flavour! This flavour is named aptly; IT’S DELICIOUS! Nothing too special, but a decent apple flavour. Wish it was a bit stronger, but still alright. Smooth green apple without too much sweetness. The perfect juice for me!!!! I’d like to see 180 do an Apple Collection. Something like a bunch of different apple flavours because I’m absolutely in love with this one. Maybe a golden delicious and a Granny Smith flavour? 180 Smoke's Applelicious: I've said it before and I'll say it again, finding the right Apple based E-liquid is extremely difficult, however, 180 carries an incredible Green Apple thats not overpowering and never dissapoints. An orchard in a bottle, apple picking anybody? Not my favourite, it is okay but muted. I was hoping for a nice crisp apple. I will play with the watts, maybe I just haven't found the sweet spot.